Sulphates, silicones, drying alcohols, methods, techniques – find your self overwhelmed after discovering the CG Method for Curly Hair? I feel you. Ready to start a routine but don’t want to spend a lot on expensive products? I’ve been exactly where you are now, in college and work before I started to earn enough to afford international brands. 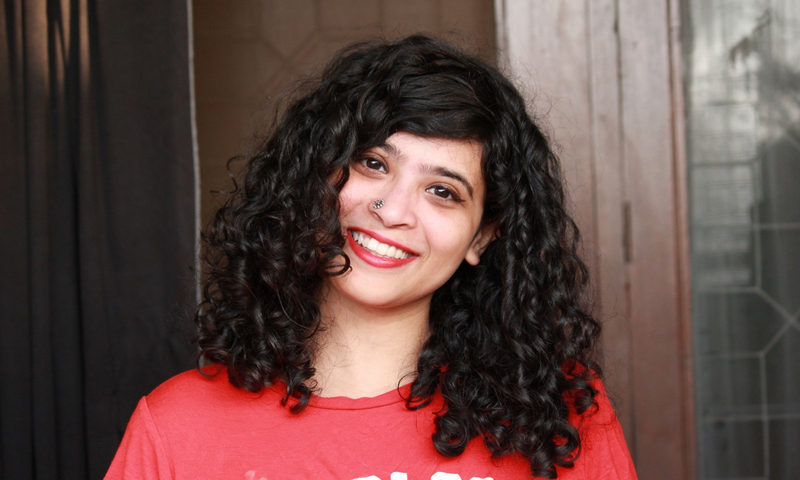 I survived on pocket-money and back then, there was NO WAY I was allowed to spend more than INR 500-1000 bucks ($14) in a month on just my hair. If that’s you as well, keep on reading! Also, this post is for anyone with curly hair, not wavy hair so if you’re not sure what hair type you have, go right now and read this – Natural Hair Types. A quick note into what IS CG Method first. We follow this routine because it doesn’t allow any product that makes our hair even more dry and frizzy. This is what I have also been broadly following for the last few years. Poo is shampoo, so pre poo is before shampoo, get it? Lightly oil your hair and use your fingers to detangle big knots & tangles. This reduces tension on your hair in the steps coming next. Use oils like argan, almond, jojoba, coconut – lighter oils work better for loose curls, thicker oils like olive oil, sesame oil, castor oil work better on tighter, thicker curls. To start afresh, we need to remove all the old silicone that is still in your hair with a shampoo that has sulphates but NO silicones. This type of shampooing is called clarifying. Drench your hair in water and apply Pantene Lively Clean (Under Rs.200) to all your hair and rinse it out. If you’re from USA, use Suave Essentials Shampoo Daily Clarifying Shampoo, TRESemme Purify & Replenish Deep Cleanse Shampoo or any Vo5 Shampoo instead. Remember- you DON’T use this shampoo each time you wash your hair after this. This is just for a final rinse. You will use another type of shampoo the next time you wash which I will explain later. Apply a moisturising, silicone-free conditioner from crown to ends. Don’t be stingy with the amount. Then use your fingers to gently detangle followed with a wide toothed comb. This is essential to reducing dryness and frizz. Rinse out. Use Loreal Smooth Intense Conditioner (Under Rs.150) or Matrix Biolage Hydrasource Conditioner (under Rs.350) if you’re from India. Peeps from abroad, try with SheaMoisture Coconut and Hibiscus Curl & Shine conditioner or Trader Joe’s Tea Tree Tingle Conditioner. Find more pocket-friendly conditioners in this list. You can also see how I shampoo and condition my hair in this IGTV video. When your hair is still slightly wet, flip your hair upside down and smooth on a CG-Friendly leave-in-conditioner or curl cream on your wet/damp hair. If you have loose curls, just smooth it on with ‘Praying Hands’ technique since you want to preserve your clumps. If you have thick and tigher curls, use a comb to distribute the product throughout your hair. You can also try As I am Leave in Conditioner, Sheamoisture Shea Moisture Coconut & Hibiscus Curl & Style Milk or TGIN Leave in Conditioner– all of these are pocket-friendly! Apply an alchohol-free gel next by smoothing on a dollop to each section. This will form a cast around your curls and help in clumping. It also protects your hair from frizzing up fast. 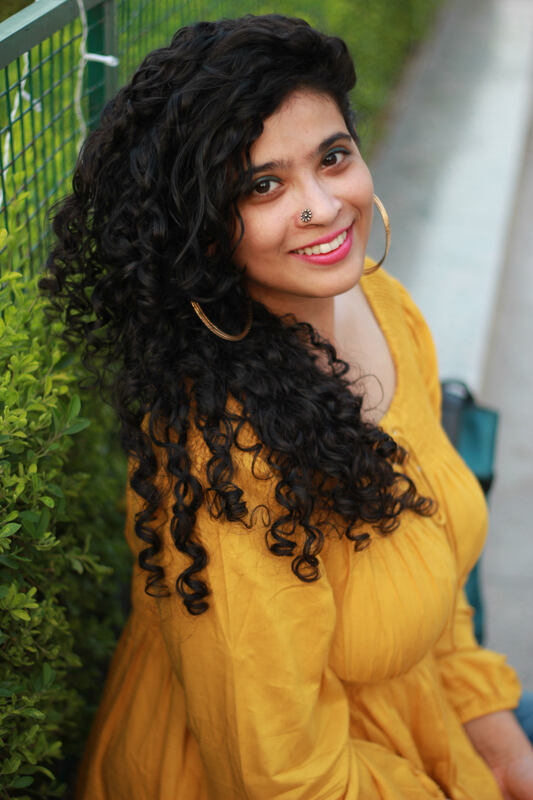 Start with – DIY Flaxseed Gel (cheapest, natural, curl-enhancing gel you can make at home) or Arata Hair Gel (Use my code CURIOUSARATA to get 15% OFF on orders equal to or above Rs.999) or Set Wet Gel (Under Rs.100). American or British curlies, try As I Am Curling Jelly, Aussie Moist Instant Freeze or Curl Keeper Gel. Watch this video tutorial to see how I style MY curls with a hair cream and hair gel. Flip your head over, take sections of your hair and squeeze up with your fingers first and then a t-shirt. Don’t comb your curls after this. Take the t-shirt and plop your hair in this manner (see video below) for 3-5 minutes. This activates your curl pattern and makes them shrink better. You can remove the t-shirt and air dry normally as you go about your day or sleep in it overnight and remove the next morning. I travel in the metro daily and like my curls dry before I leave home and that is why I use a diffuser. Once the curls fully dry, you’ll find your curls are dry and crunchy. This is normal. You need to soften it by taking a light oil in your palms (Jojoba, almond work great) and gently scrunching the sections of hair again. Then fluff the roots of your hair to create some volume on the crown. At night, to protect your curls from getting flat, tie your hair into a pine-apple like this (see video above) and cover with a satin hair cap or satin scarf. This fabric will help preserve your curls longer. Indian curlies, check this satin cap and this satin scarf. US curlies, try this satin bonnet or this buff to protect your curls! On the next day, and the next, until you wash again, you can’t comb your curls dry. To revive your hair which will become slightly more frizzy as each day pasts, follow this refresh routine. Spray some water on your curls and then smooth on a small amount of cream or gel on the frizzy parts. Fluff the roots again and let it dry. Do this every morning until your hair is frizzy and flat again and in need for another wash.
Now the second time and almost every other time you wash your hair, you will use a shampoo WITHOUT sulphates and silicones. Remember, the first shampoo you used was just a way to deep cleanse your hair. Now only light cleansing is required and you will need a CG Friendly shampoo. or Giovanni Organic Tea Tree Triple Treat Invigorating Shampoo (Rs.547). Find more options here in this list. After this shampoo, follow the same steps as you did on Day 1, i.e conditioning & styling! If you gym or swim a lot, you may need to wash your hair more often. In this case, mid-washes, use a product called a co-wash. This is actually a conditioner. With this you need to apply it to your scalp and use your fingers to scrub out the dirt. I personally don’t recommend ONLY co-washing. You need to cleanse your scalp for healthy hair growth so make sure you shampoo (CG Friendly) or clarify once in a while, especially if you suffer from an itchy scalp. You can start with Enliven Natural Fruit Extracts Coconut and Vanilla Conditioner – CG Friendly (Rs.305) or As I Am Coconut Cowash Cleansing Conditioner – CG Friendly (Rs.1500) if you’re in India. Peeps in the US, try either As I Am Coconut Cowash Cleansing Conditioner or Mielle Organics Detangling Co-wash. This is SO important if you have curly hair. You need to start off with deep conditioning at least once a week. Deep conditioning is basically doing a hair spa or putting on a hair mask. It will work intensely for a short time on your curls making it softer and smoother. Mix some conditioner + 1 tsp honey + 1 tsp oil of your choice or use Lotus Herbals Soyasmooth Protein Creme Deep Conditioner – CG Friendly (Rs. 189) or Aaranyaa Spa At Home Argan Oil Hair Pack – CG Friendly (Rs. 333) or MATRIX By fbb Hydra Creme Intense Ultra Hydra Source Hydrating Masque (Rs.445) for Indian curlies. International curlies try SheaMoisture Raw Shea Butter Deep Treatment Masque or the Curls Blueberry Bliss Reperative Hair Mask. It looks like a long list but honestly, this routine takes me about 15-20 mins in the morning (except diffusing). Just try it once and see the difference in your curly hair! Don’t forget to share your results with me by DMing my Instagram (@thecuriousjalebi) or share it on my private Facebook group Ask Jalebi. If you know someone with frizzy, curly hair, please share this article with them!